3 Time N.H.R.A. record holder and also defending 2015 Can-Am Stock/Super Stock series champion Chuck Nagy from Niagara Falls, ON. in his GT/TA GMC Sonoma defeating Indiana’s Scotty Stillings in his Pontiac Grand-Am. 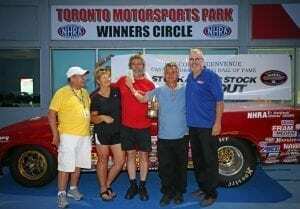 John Scotti and the Canadian Drag Racing Hall Of Fame would like to thank our sponsors NAPA-CMAX and CASTROL, the racers & pit crews, Uli Bieri and his team from Toronto Motorsports Park, Dave Mohn and his team from the N.H.R.A. and the race fans.